Over the last couple years it seems like I can't walk through a boat yard without seeing at least one Intrepid boat. I've had my eye on them for a while now, so I finally broke down and called the company to see if they would make one of their boats available to me. Well, they didn't make just one boat available, but three of them. The one I set my sights on is this 28' walkaround. In case you're not familiar with Intrepid, they are a builder of high end, mainly center console open type boats, though their current line ranges from 26 to 40 feet, consisting of 10 different models. Built in Largo, Florida, they are sold builder-direct through their Dania (Ft. Lauderdale) sales office. The company was founded in 1983 and their high quality, distinctly offshore style boats caught on quickly amongst the rod and reel crowd of South Florida. Not all of their models are exclusively sport fishermen. Several, models, like this 289 and the 339 walkarounds impressed me as two good examples of multipurpose boats. Though certainly not cruisers, they do make good day boats. Knowing that all builders try hard to make their boats look good, and that for many the beauty is only skin deep, here we set out to find out what lies beneath the great surface appearance. We're not going to show you lots of pretty pictures: you can get those from a brochure. Our interest here is on the engineering behind the pretty stuff. Hull The hulls are all PVC foam cored on the sides and solid laminates on the bottoms. The 289 has a single set of fiberglass stringers laminated over a foam former. Note there is that is technically incorrect to call stringers like this "foam cored," for the foam does not serve as a core, but merely a form over which to lay the laminates. At the mid section the stringers measured 14" tall. The deep forward entry profile presents little surface area to waves. On this model, a cut out for a transducer revealed a bottom thickness of 5/8" of solid glass. The cored hull sides seemed to be close to an inch thick. On thumping the hull sides with my fist, there was no deflection and the sides did not rattle like most boats will when you do this. But the real surprise came about when looking up under the gunwhale, for not only is the deck laminated to the hull, but I saw at least four large frames spanning between the deck joint, deck and inside cockpit flange. Wow! This is what I've long thought all boat builders should be doing in order to strengthen the gunwales/deck join/rub rails yet this is the first builder I've ever seen to do this. And by the way, one thing I've noticed about older Intrepids is that you don't find zillions of stress cracks above the rub rails like you do on so many other boats. In fact, one three year old 26 footer we looked at did not have a single stress crack on the entire boat. Just goes to show you that stress cracking is NOT the nature of beast. All the Intrepid hulls are stepped. They say it improves performance. Others have argued that if there is any performance gain, it is negligible. To answer this question would require some costly empirical testing, so I don't have the answer. On the other hand, the 22 degree hull deadrise, in conjunction with the narrower beam, yields the kind of rough water performance you'd expect from this race boat style hull. A fine entry, minimal bottom surface area, combined with a very deep vee will keep this boat running with the best of them, the hull absorbing more punishment that most operators could withstand when pushing it to extremes. Bimini and back for the afternoon in 3 foot seas, no problem. This is looking up under the gunwale showing the small frames that support the deck joint. Cockpit Deck The cockpit deck is a composite. I was handed a sample of the "core" that was labeled "space age wood replacement." A half inch thick dark gray high density material with several layers of glass fibers in it plainly evident, I'm not sure that I would call this a core in the sense that we think of cores as being something that is lightweight. Near as I can tell, the material is only slightly lighter than a solid glass laminate, and yields a very solid feeling underfoot. And best of all, it's not going to absorb water. Oh, yes, and the deck is glassed to the tops of the stringers. The cockpit liner is not bonded to hull sides, but free-floating as I think it should be. Liners that touch the hull sides are prone to rattling. This view is looking aft at transom. Note the huge knee at center that gives additional support to transom. Also note that the washers behind motor mount bolts are too small and are being crushed. These bolts need bigger backing plates. The cockpit deck also has big drainage gutters along the perimeter that lead aft to an athwartships gutter and thence to hull side scuppers, each of which has a flapper valve and clamshell scoop over it. Yet, one look at the transom tells you that there is little to worry about with tanking water over the transom. I counted a total of eight hatches in the decks, everything from fishboxes, to storage wells, to plain old hull access hatches. Each and every one of them had full-fledged gutters around the hatches and solid stainless steel locking dogs. Each of the hinges had one bolt but the rest of the fasteners were screws, so they nipped a few corners here. Along the transom there is a deep live well in each corner, but it is lacking in any kind of tackle storage. The engine mounting is in a sort of old fashioned motor well, meaning no integral platform extension, a design feature that is not going to appeal much to divers, though there is a small bolt-on platform either side of the motor well. The electrical system. This picture tells it all. The standup bolter style helm seat is notably large and takes up a big hunk of cockpit space. And with the optional rear bench seat, the aft cockpit becomes rather cramped. I also very much liked the contoured T-top supported by a forward raked arch-like framework. The after part is hinged so as to flip back out of the way when fishing. What motivates me to call this a multipurpose boat and not a pure fisherman is the curved settee forward of the helm. One of my long standing complaints about pure fishermen has been the lack of decent seating for anyone but the driver. He gets a nice comfortable spot while the passengers are left to either stand, or dangle their butts over the edge of the gunwales, hanging on for dear life. And being semi-protected against spray, it's a nice touch that turns this into a bit more than a fish boat. One of the things that Intrepid prides itself on, says sales manager Mike Obolsky, is in catering to the customer's desires. They're willing to change just about anything, so long as the client is willing to foot the bill. In fact, he attributes some of their new models to extensive customization requested by customers. For example, if you wanted the optional aft seat, it wouldn't be much of a problem to create a bit smaller helm seat so that you end up with more space in the aft cockpit. Interestingly, when I went to move the rear seat, I was amazed at how light it is. As large as it is, one person can remove it from the boat. Not with ease, but also without killing yourself or damaging the boat in the process. And speaking of seating, there is no plywood. The steering wheel is on a 15 degree angle ( the way I like 'em) with the controls set about the same, in a recess about 4" lower than the wheel so as to give the best position for control operation. Imagine! Someone actually took the time to figure the best ergonomic placement. Looking up under the helm console, we find the wiring installation as neat as can be, without a single wire out of place. We didn't find any sloppy installations. Everything, including hoses, are well secured. However, the console is notably lacking in space to mount electronics, so that an overhead console from the aluminum T-top is almost mandatory if you're an electronics freak. Deck cleats have aluminum back up plates. All above waterline through hulls are chromed bronze. Mooring cleats are large stainless, plus there are pop up cleats for securing fenders and the like. Shore power and battery charger are optional. The standard fuel tank is 193 gallon aluminum. It is located deep in the bilge under a removable plate and we could not determine how it is installed as there is little access, just like so many other boats of its class. The transom motor mount is hull-integral. We were shown a cutaway section that was three inches thick that showed it to be mostly solid glass lay up with a small amount of foam core. That should hold the twin Yamaha 225 engines mounted on this one, which is her maximum horsepower rating. And by the way, Intrepid is not allied with any engine manufacturer and will install the engines of your choice. Billed as a high end boat that's designed and built right, the Intrepid 289 clearly lives up to that billing. You'll find other neat touches like a gutter around the rope locker hatch that keeps water out and prevents anchor chain from rusting and anchor rodes from becoming sodden, mildewed messes. For a 28 foot walkaround, it seems like a remarkably big boat. There's no comparison with a 27 foot Grady-White Sailfish, which in contrast seems small. Even the cabin space seems larger. What makes the difference is in the placement of the helm as a console set aft, rather than a traditional bulkhead mount helm. Access to the foredeck is nice and easy, with a good hand hold available on the cuddy side coaming. At first glance, I thought the cabin door top hatch was kind of goofy, until I saw how easily it slid back out of the way. It's shaped like a quarter-circle and pivots on a single pin, and is far better than any hinged hatch I've seen. All you've got to do is push it out of the way. There's not much to be said for any cuddy cabin in a small boat, but the head compartment is at least large enough to be useable. Instead of a reefer, it's got a recess in the counter top fitted for a removable ice cooler, which probably makes more sense than trying to put an electric reefer into a space that would barely allow the door to open. Quality-wise, a Grady doesn't hold a candle to this boat. When we look beneath the skin of a Grady, it's second rate by comparison with its exposed wood framing and sloppy wiring and foam sprayed all over. And the price differential not being much, there's little doubt about which one I'd choose. If you're interested in heading out to sea in a top of the line boat, the Intrepids deserve serious consideration. 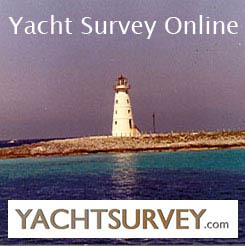 Buying, Owning, Maintaining a Boat or Yacht. Over 160 articles by David Pascoe. Text, Images: Copyright© 2000-2018 David Pascoe All rights reserved. Web design, developement: Copyright© 2000 - 2019 Junko A. Pascoe All rights reserved.